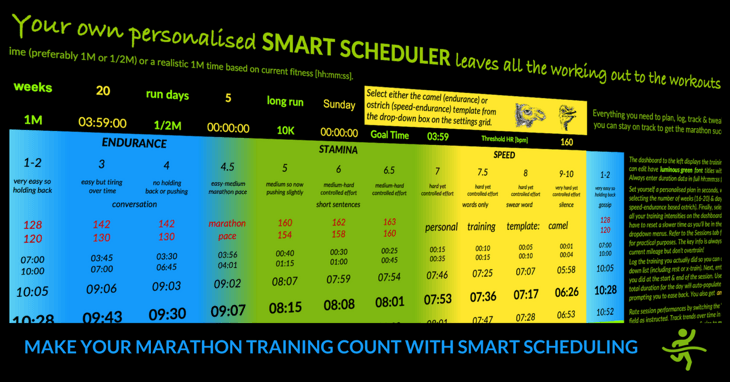 The Smart Scheduler is a marathon schedule training tool that makes it easy to plan and manage your marathon training. To access it, check out the Marathon Mastery online training area and community. We have a different format this week because some viewers have asked for more details on the Smart Scheduler tool that’s featured in many previous episodes. So I thought I’d run you through exactly how to use it. There’s lots of great takeaways on how to plan, log, track and tweak your marathon plan. I‘m going to show you how you can create your personalised marathon training plan in just a few seconds. So you can track and tweak the plan as you progress towards your marathon goal. Guidance is also provided on the scheduler itself if you need it. Yes, I’ve sacrificed the clean minimal look! Based on feedback from fellow runners who wanted all the info there and then when they most need it. Which if you’re looking for a PB should be a flat, fast course in a suitable climate for endurance running. Let’s use the London Marathon as an example. Once you set the date of your event, the dates for each planned session are auto-populated. Select the number of weeks you have available to train. I recommend at least 16 to move through each of the marathon training phases. Up to 20 to give yourself plenty of preparation time without getting stale and losing motivation. So, if we reset the weeks to 16, notice that the dates change accordingly. So you get the best preparation for the time you have available. Notice, for example, that week 5 of the Trail Phase is sacrificed when you have fewer than 20 weeks available. You have the option of just training through the marathon-specific Pillars and Pediment Phases. But don’t be tempted to do this if you’re not ready for race-specific training! Select the number of run days you can commit to each week. And I also firmly advocate at least 1 rest day per week. If that suits your lifestyle better. So you can get personalised pace ranges for your sessions. Regardless of whether it’s then displayed as hh:mm:ss, hh:mm or mm:ss. Although you have that option too. Note that whatever you enter is used to estimate your marathon goal time at that point. The dashboard now displays personalised pace ranges (average, fastest and slowest) in minutes and seconds per mile across all the marathon training zones. You might be tempted to enter that stretching yet hopefully achievable marathon time you aspire to. As you will be in the early stages of your marathon preparation and therefore at risk of overtraining. You also have the option to enter your Threshold Heart Rate. This is your average heart rate in beats per minute in the last 20 minutes of a 30-minute time-trial. Because it’s less reliable as a measure at higher intensities. Finally, to create your personalised plan you just have to select your marathon training preference. But we’ll quickly cover the other readings on the dashboard before we get on to logging your training. Which is made more real with the Feel Test and Talk Test indicators. If you were racing rather than training. And in the fastest zone, you’d be doing a short track-type race lasting between 1 and 4 minutes. The final reading is a summary of the percentages of total training time spent in each of the three broad zones for your plan. What’s neat about this is it’s optimised for marathon running for any plan you create. So let’s look now at the different settings for a planned training week. Next to each auto-populated date we have the planned sessions. I’ve created a quick reference checklist on how to perform each workout in the sessions tab. And the emphasis also shifts from RPE/HR to pace as the training becomes more marathon-specific. The session grid displays the number of reps, the duration of efforts, their intensity by virtue of which zone they’re in and how much recovery you get. Particularly for the mixed intensity sessions like hilly runs or fartlek. But in practice just follow the simple guidelines on how to perform each mixed intensity workout in the sessions tab. To better understand where the training fits in to the overall marathon campaign. And always remember the plan is just a framework not a prescription and you’ll be fine. There are two further tweaks you can make to your plan within each training week. Firstly, you can switch the key sessions around and even insert practice races in some weeks. These choices are informed by where you are in your marathon build up to stop you overreaching. So, you won’t be offered marathon-specific workouts like faster repeats in the Trail Phase. And the practice races only become options towards the end of the earlier phases and in the middle of the Pillars Phase. Secondly, you can adjust the volume of steady running to match your current mileage. Please don’t abuse this though by ramping up your mileage and putting yourself at risk of injury or burnout. You must remember to apply any changes consistently throughout your plan to maintain the right balance. So let’s now look at how easy it is to log your training in the right-hand grid on the scheduler. And you simply select the one you did that day (it includes rest & x-train if you didn’t run). The duration of the recoveries between repeats. You will probably enter at least 5 minutes in the recovery field to cover the jogging at the start and end of the session. Or even an easy run, if you were doing two sessions that day. The next column auto-populates the total duration for that day. Then in the final numbers column, you manually record your mileage. Prompting you to ease back. So you’re being well looked after! The final column asks you to rate your performance for each session using the drop-down menu. But you can select ‘too tough’ or ‘too easy’ when expectations weren’t met. Then finally, you provide weekly feedback in the text field. I suggest you use this to comment on any mitigating factors accounting for your performances. Also, don’t be too modest to give yourself praise for toughing out hard sessions. Reviewing this kind of feedback just before your marathon can be very inspiring! And note the actual times you recorded for practice races and predictor workouts. The beauty of having a personalised plan is you’re most likely only going to have to tweak your training along the way. Which in term adjusts the training zone pace ranges. Or even an extra rest day if you feel you need more recovery time.